Engagement is not a trade-off, a simple alternation of give-and-take. It is founded on paying attention to input and output simultaneously, all (or much of) the time, so there is no major gap between them, no lull in attention to both self and world. When we get on a roll, that’s what happens. We are in the moment totally, not separating input from output but seeing both as integral parts of the same state of mind. We are with it, whatever it is. We are mindfarers so fully engaged with our surroundings that we become an integral part of the scene wherever we are. As mindfarers, we want our companions to win along with us, not go down in defeat. Each needs to win in her own way. If Israelis and Palestinians fight until only one is left standing, they both lose. Neither side can sacrifice its integrity to the other. Mindfaring (finding our inner way) is a matter of coordinating our lives with our surroundings, as in dancing, as in music, as in a good marriage, as in sports governed by rules. It is being both with ourselves and with the other, not in spite of. It is a matter of being together with someone or something else. Of being yourself in a scene or setting that is wholly itself at the same time, so your engagement is mutual, both on an equal footing. Each plays her part, not going off on his own. It is an extension of a state of mind that embraces our partner in engagement, whether person, place, or thing. Such engagements are fundamentally different states of mind than opposing, conflicting, fighting, defeating. There are times when you must run for your life, and times you must run toward your life or it might get away from you. Mindfaring is running toward, not away. It is seeking, not avoiding. Moving ahead, always ahead (seldom in a straight line). In company with respected companions. Along a path that leads to a natural culmination of the going itself. Mindfaring is powered by the dimensions of intelligence (experience or consciousness) that make up the situation we are in at a particular point in our life engagements. Those dimensions are qualities that, taken collectively, give structure to a particular moment of awareness and experience. Such dimensions reflect the balance between the affective roilings and turnings-over in our minds or, in neural terms, along the axis between the midbrain reticular formation and the prefrontal cortex via the limbic system (including amygdala, hippocampus, thalamus, hypothalamus, and septal nuclei)—all in response to the signals derived from our ongoing engagement with our surroundings that spark our intelligence, judgment, and subsequent actions. Here is a diagram from page 275 of my 1982 dissertation, Metaphor to Mythology, that illustrates neural pathways in the brain that support our engagements with the world. 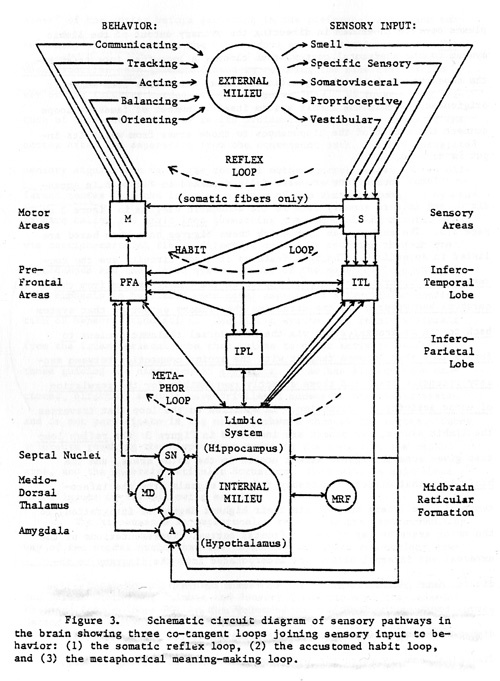 Sensory pathways in the brain, sensory input on right, motor pathways on left, limbic system lower center, loops of engagement suggested by dotted lines. In experiential terms, those affective roilings and turnings-over in our mental innards include arousal, memory, expectancy, attention, sensory impressions, recognition, understanding, imagination, meaning, thought, feeling, emotion, biological and cultural values, humor, comparison, polarity, attitude, and judgment, all abetted by our goals, relationships, projects, selection of tools, skills, language skills, speech, gestures, and overt action, among other dimensions that come to the fore in specific situations. How does this bear on the relationship between mind and brain? We are each born to our respective worlds of nature, culture, community, and family, all of which challenge and feed our minds on a daily basis, so we become part of them, and they part of us as a kind of reference system that, as we engage with it, defines our uniqueness in our particular time and place in our Earthly career. Our brains process the endless stream of signals resulting from our engagements, but leave nature, culture, community, and family outside of ourselves where we can draw upon them as needed in particular situations. The situations we find (or put) ourselves in are temporary configurations of the dimensions of our intelligence as affected by the roilings and turnings-over spurred by our ongoing engagements. They morph into subsequent situations as modified by the ever-changing flux of our experience. We don’t lug all our memories around with us as an accumulating store of baggage, but develop neural networks capable of recognizing familiar patterns of traffic flowing through them. Our brains excel at pattern recognition, nesting ever-finer concepts together on a great many levels of discrimination. Our brains give us a capacity to recognize patterns as having been met before, not to store those patterns in finest detail. That is, our brains are no bigger than they need to be to process the engagements we set up between our adventurous insides and ever-changing outsides. What is outside stays outside as a facet of nature, culture, community, and family. When we die, we die to them. They stay behind; we don’t take them with us. The brain is not a filing cabinet or a closet full of old clothes. It is a director of traffic from perception to action via an experienced and intelligent self that serves as a situation evaluator in matching incoming sensory impressions to outgoing gestures, speech, and actions.